The all new BMW Motorrad E-Scooter Concept promises to be the perfect means of transportation for the future urban dweller. The scooter has an all-electric drive train, top speeds that are safe for highway travels and a battery that can take you up to 62 miles on a single charge. Plus, this is a scooter fit for two, so feel free to take a date on a ride to the countryside without worrying about your scooter emissions spewing into the pristine environment. Watch a video of the prototype zipping around a track at impressive speeds after the jump. 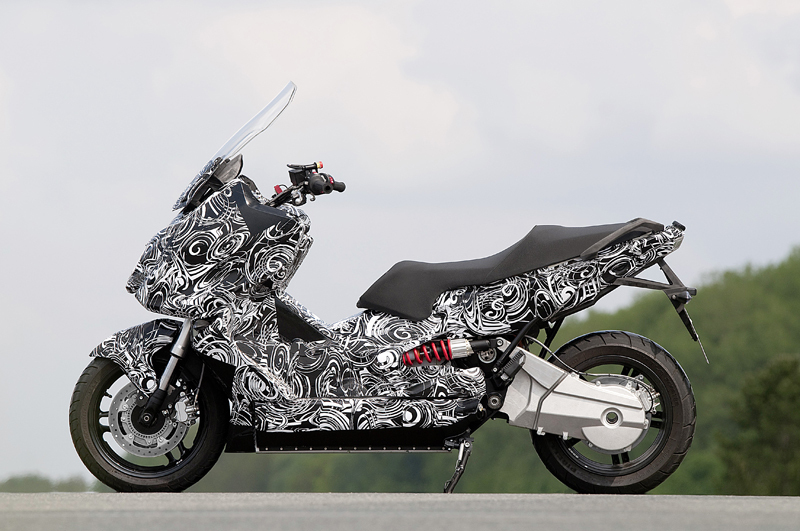 The BMW Motorrad E-Scooter was funded in part by the German Federal Ministry of Transport, Building and Urban Development which supported the scooter research with the understanding that BMW wanted to create a vehicle that had realistic real world potential. Current road-worthy e-scooters are limited to driving within towns and cities because their top speeds are too low for highway driving and their distance-capacity is too small for any extended use. BMW’s Motorrad E-Scooter can make its way onto faster roads — though definitely not in the fast lane, since it tops out at 40 mph — and can zip you from the suburbs to the city and back again without needing to visit a fast charger. To make this new scooter lighter, BMW used the aluminum battery casing as the frame of the bike — instead of a heavier frame that most traditional bikes use — which brings down its overall energy use. The scooter recoups all energy used when decelerating or breaking and reroutes it back to the battery to power the scooter the next time it speeds up. In addition to being friendlier to the earth, the BMW Motorrad E-Scooter is safer for the driver as well, and it is the first time that safety standards typically applied to conventional cars have been applied to a two wheeled, electric scooter — just make sure you wear a helmet. This is really great news for the e-bikes and e-Motorcycles. having a big company make the investment is huge. visit www.chargedelectricscooters.com for additional information. (hmm, this was my first comment, it seems to have gone walkies) Like the range, like the looks .... ... not too sure about the top speed! Give it the ability to hit 70-75mph if you ask that of it, and I'd be more interested. It's not like a more powerful electric motor is significantly less efficient at low speeds than a smaller one, like with a gas motor. 40mph is more what you'd expect from an old 50cc step-thru like the Honda Cub. And this has got considerably beefier tyres and brakes than not only that old soldier, but my current 125cc bike. Maybe the designers were expecting something a lot more potent and specified the running gear to match? You'll end up paying for their extra weight in the handling and range, and higher replacement costs, but never go fast enough to actually get any benefit. Of course, the range would drop once you went faster, but you'd probably still be able to rely on getting 50km out of it at full throttle. Which means my 60km-ish daily round trip on a mix of 30-40mph city streets and 60-70mph *official* limit motorways and rural roads would still be practical, particularly if I could plug in briefly at work if it showed my range as under 50% on parking up (and if there was a site power cut, I could still make it home entirely on the slower streets). Charge it overnight (100km of bike travel probably doesn't need more than three or four hours at a lowly 2.5kW rate; my 8.5kW bike can sustain 105+km/h...) and you're good to go again, without visiting the gas station. OK, I need 4 charges to match my current full-tank 400km, but if that just amounts to parking in the garage and hooking it up to a household plug, that beats going off to the filling station once a week, waiting in a queue, possibly having kitted up special to do it, filling the tank, digging out wallet, waiting for a receipt, etc... I do sometimes do longer journeys, but I don't think I've yet done more than 100k in a single "leg" more than 3 or 4 times. As this would be more of a second vehicle rather than someone's main transport, it shouldn't be so much of a problem. Only 62 miles? The gas-powered versions of these scooters get 70+ MPG and can usually hold 3 gallons of gas for -- easily -- three times the range. And before someone says, "It's a scooter, meant for the city , you need to read up on the toughness of some riders and how exactly they break the rules of common convention. A rider in Canada rode his scooter from ocean to ocean. http://scootercanada.weebly.com/ In Asian countries, motorcycles/scooters outnumber cars by a an almost exponential margin, carrying families, animals, cargo. You name it. As expensive as a BMW scooter is going to be, it seems a high price to pay for something that will be limited to city-only usage.